The worst damage that driveways incur during the winter is from freezing or thawing snow. When it freezes the ice will damage the surface, meanwhile when it thaws the water could seep into cracks or gaps in the paving and weaken the materials. Shovelling the snow as soon as it lands will prevent either of these things from happening. This will not prevent ice from forming but it will certainly limit the damage done to your driveway. Most driveways don’t stay in pristine condition. Whether it is from the regular use of cars or from generally being exposed to the elements, driveways will incur natural damage. Even driveways known for their durability and longevity like block paving will get small cracks after a few years. Usually this is nothing to worry about – at least, not for a while. However, if water enters the cracks during the winter and becomes frozen it can expand the damage. You may even start to get potholes in extreme cases. This can be prevented by sealing the driveway before winter arrives. This may need to be done by a professional and we provide this service here at J&L Landscapes. 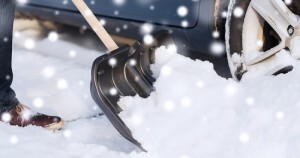 Not all products commonly used to remove ice or snow from a surface will be suitable for your driveway. In fact, chemicals and salts will probably do more harm than good. These will get under the surface and damage underneath the concrete causing it to crack or deteriorate. Instead, the best solution is to cover the areas with sand to provide better grip and traction. Your driveway can become quite a state if snow or freezing occur while sticks, twigs and leaves are already scattered across the ground. Furthermore, it can make clearing the driveway a lot more difficult afterwards. Removing ice and snow will be a lot easier in the long-run if you keep on top of it early. The cost of purchasing a few essential tools that will keep your driveway in good condition throughout the winter is a lot less than the money it would require to fix one that’s damaged by ice or snow. So, get to your nearest DIY store before the bad weather arrives and pick up a few things you might need. This includes shovels to remove the snow from your driveway (as mentioned in point 1) or sand to provide extra traction when ice occurs (see point 3).